Failed Commodore experiment. Actually, a very nice 8-bit. 64K RAM. Nice graphics ability. Pixels could be any of 128 colors (16 colors at 8 intensity levels). Four software programs included on the ROMs. None of them were worth much. (The word processor could only handle 99 lines of text.) This computer was sold as a successor to the C64. There was another computer, the Commodore C16, which was a successor to the VIC 20. 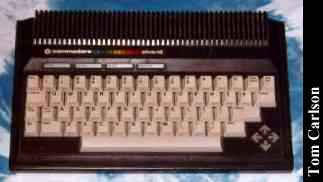 I have also heard of one called the C116, which apparently was a C16 with a membrane keyboard, like a Sinclair. I caught your entry in the obsolete computer museum. A funny bit, which brings back memories. I started work at Commodore in October of 1983, my second job out of college, after four months of boredom at General Electric. I was hired to help out on the "TED" project. TED, you see, was an all-in-one cheap computer chip. It improved on a number of the things that were done in the C64, so you didn't need extra SRAMs, you got more color, etc. Ok, so the sound sucked. Anyway, this project was started by Jack Tramiel as an answer to the Timex Sinclair, as well as a replacement for the VIC-20 (eg, a real computer that sold for about $100). The basic idea was to sell a 64K computer, or close, to that market. The result was the membrane keyboard version called the C116. By the time I was hired, big nonsense was in full swing. For unknown reasons, the TED project was split into several machines. There was the C264, which had the full complement of stuff, 64K of RAM, etc. The C232 was a scaled-down version, with 32K and no serial port (TED systems, unlike C64s, has a real 6551 hardware ACIA). Eventually, there was the CV364, which I was in charge of for the two weeks between it becoming an official, for production unit, and it being cancelled forever. Take the C264, add a new version of the Magic Voice (we called it Tragic Voice) speech synthesizer module, add a numeric keypad, and you have your CV364. I think I still have one of the two units actually made with production plastic (it was shown at the '84 Winter CES, but with mock-up casework). The TED systems had some advantages over the C64. BASIC 3.5 has real graphics commands in it. It used a dynamic ROM banking scheme, so you got nearly 64K in BASIC (this was later used on the C128). ROM cartridges, and an internal ROM slot, could also be banked. Orginally, the C264 was to be offered with Your Choice of ROM option; EasyCalc, LOGO, etc. Later, it got the horrible 3+1 package, and was redubbed the PLUS/4. Some time later, a scaled down 16K version was introduced as the C16. All in all, the PLUS/4 wasn't a bad computer, when compared to others at the same price range. What was wrong with it? The C64. Why make an incremental, incompatible step above the C64. Everyone who tried to take on the C64 was laid to waste: Atari, Coleco Adam, Mattel Aquarius, etc. How could the PLUS/4 do any better. Rear view, showing all the non-standard ports, as well as expansion and cartridge ports. Click here to view all comments for the Commodore Plus/4 and to leave your own.